One troubling fact about this watchlist is that an individual does not need to have an intent to injure or cause physical pain to a security screener in order to be put on this list. An offense as minor as loitering near security checkpoints can land you a spot on the watch list that will affect all your future travel. It also leads to increased security screenings of family members who travel. All it takes to be nominated to this watchlist is “reasonable suspicion” on the part of TSA agents. This suspicion can be pulled from places like social media as well, which further damages privacy protections and can hurt free speech. Additionally, loved ones of people on the list can be monitored, despite having raised no suspicion. This watchlist is an anti-privacy tactic that gives the government access to a large amount of our personal information that requires no burden of proof on the government, simply a reasonable suspicion. If abused, the government will be able to monitor individuals and use their information to further track innocent Americans and their families. The TSA is an administration that is meant to keep travelers safe. In reality, however, it is continuously stripping citizen’s of their privacy protections and has failed 95 percent of security trials conducted by the Department of Homeland Security (DHS). These privacy invasions are troublesome at best, and Orwellian at worst. There are many cases where the TSA has groped individuals based on false explosives alerts over the years as well. In 2016, the TSA thoroughly groped a ten-year-old girl in the Raleigh-Durham airport. In an interview with Good Morning America, the girl explained her experience as very uncomfortable and violating. 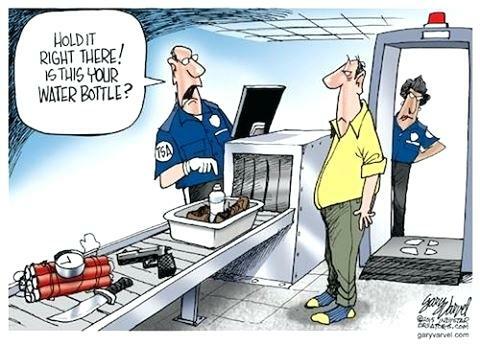 That same year Jim Bovard, a libertarian political commentator, shared a similar experience with the TSA and noted that they recorded him in the airport from start to finish, except when he was in the private room receiving an invasive search. Thousands of Americans have filed complaints against excessive pat downs at security checkpoints. It is clear that your rights don’t matter to the TSA while you’re in an airport, regardless of the Constitution’s privacy protections. With many of these intensive security screenings happening every day, not only is there a chance of innocent travelers missing their flights, they are also losing their constitutional rights. In this way, the TSA actually does more harm than good to American travelers and has its priorities wildly out of order.